Construction Claims Advisor - a $329 value! *See below for selected titles - Offer expires April 15. Shop drawings are an integral part of the construction process and present unique legal challenges. Design professionals are generally responsible for plans and specifications, while contractors are responsible for the means and methods they employ to construct a project. Construction details are often produced by contractors and their subcontractors, however, and reviewed by the design professional before being utilized. In this manner, constructors and subcontractors may venture into the design process and subject themselves to its attendant risks and liabilities. 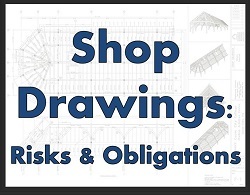 The production and use of these “shop drawings” involves a carefully orchestrated flow of papers, and attention to each party’s proper role is important for minimizing risk. This presentation is a must if you’re a public or private owner, construction manager, contractor, subcontractor, consultant, architect, engineer or attorney. Stephen A. Hess has been identified as a Best Lawyer in America in “Construction Law” and in “Litigation – Construction” through his practice with Sherman & Howard, LLC in Colorado. In addition to serving clients on matters around the country, Mr. Hess is an active author, scholar, and speaker. He is currently the Editor of the American Bar Association’s law review The Construction Lawyer, previously served as Editor of Construction Briefings, a national construction law review, and has edited national construction law treatises. Mr. Hess has written numerous law review articles on topics covering the breadth of construction law and litigation, has spoken nationally at construction law programs, has written several treatises on litigation-related issues, and is an Adjunct Professor at Sturm College of Law (University of Denver), where he created the school’s Construction Law Seminar. He is a member of the American Arbitration Association’s National Roster of Construction Arbitrators.